This is Najah Shakir, Program Manager at Boston Bikes, the City of Boston’s bike department. During the warmer months, you will usually find her riding Hubway to work and around the city, but until the system gets running year round — an idea Cycle Style Boston fully endorses — she rides her Globe Daily 3-speed in the off-season. 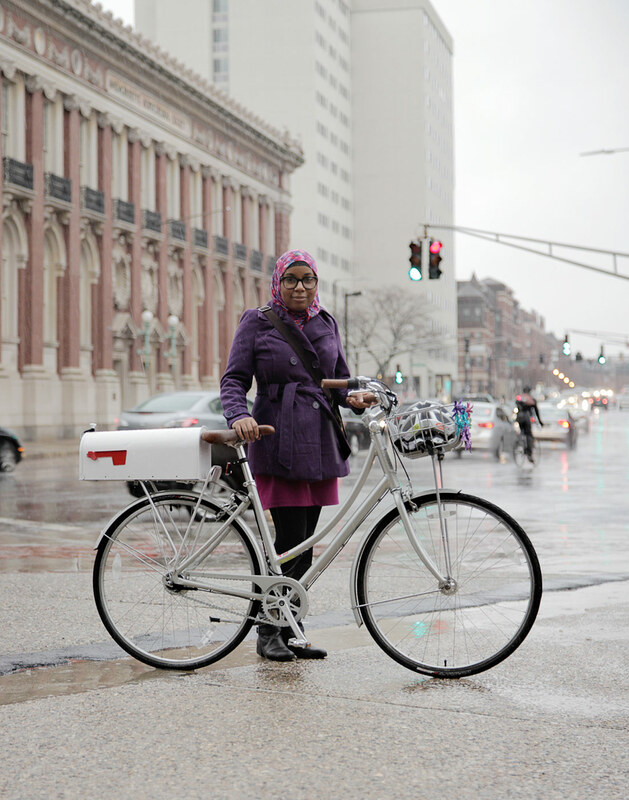 We caught up with Najah recently for a little Q&A about her work and biking in Boston. Tell us about what you do at Boston Bikes? In general, I work on making Boston a safer and more welcoming city for cyclists. In addition to typical bike projects like racks and lanes, my day-to-day activities include managing the Boston Bikes social media accounts, mailing maps and helmets, and managing subsidized Hubway memberships. Special projects include Bike Fridays, annual bike counts, and the urban cycling campaign. Our current transportation systems are unsustainable, and create extreme burdens on personal finances and the environment. Bikes are the least expensive, and, with proper infrastructure, most accessible form of transportation. Everyday I help make it easier for people to realize and take advantage of the freedom of cycling. I’m proud to be part of this movement towards a more just transportation system. Where is your favorite place to ride a bike in the city of Boston, and why? My favorite place to ride is through urban canyons — city streets with tall buildings on either side. So really, anywhere downtown. I love the way the man-made structures imitate the beauty found in nature. Riding on Boylston to work is always wonderful, but I’d recommend Commonwealth Ave to new urban-cyclists since there is a bike lane. Ride on, Najah, and keep up the good work! love the mailbox! what a fantastic person to highlight, nice job cyclestyle, & ride on Najah! I’m glad Boston has included such a perspicacious young person among the leaders who are working diligently to maintain Boston as a thriving and environmentally friendly city. Keep up the good work Najah!